The Capital Judicial Center in Augusta, Maine, designed by PDT Architects, opened in March. The 4-story 120,000-sf courthouse combines superior and district courts with other court functions on a steeply sloping site adjacent to the historic Kennebec County Courthouse, to which it is linked by a second-floor bridge. The design observes ideal courthouse planning principles, with separate, secure circulation for staff, detainees, and the judiciary. The project is targeting LEED Silver certification. High efficiency zone heating and cooling is provided by chilled beams and radiant floor heating. One of the most stunning features is the natural daylight that pours into the public lobby and corridors as well as into the courtrooms and workspaces. In addition to the building itself, a comprehensive green education program will be installed in the courthouse later this summer. Green education signage will be installed into the building's spaces to educate the occupants and visitors of the green building features of the courthouse. The signage will be installed in both the public and secure staff areas. 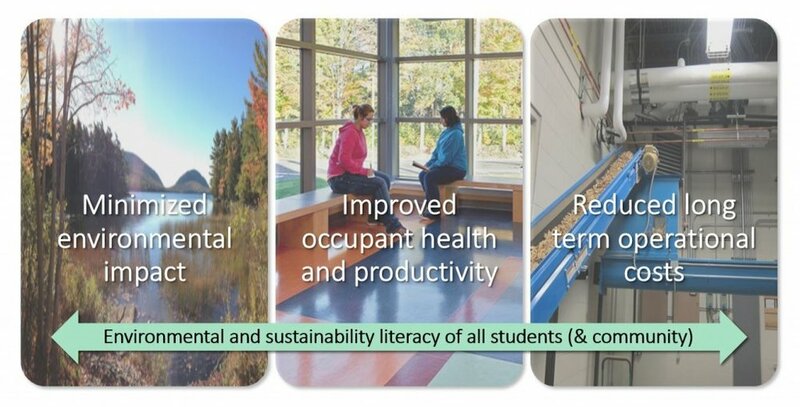 Rack cards summarizing the sustainable features of the building will be available in the first floor public lobby and sustainable living facts will be on the digital displays throughout the building. For a preview of the signage, see below. Design was recently completed for a new 1,250-sf hybrid operating room and adjoining control room. A hybrid OR merges the surgical capability of a large-scale OR with the imaging advantages of a catheterization lab. It allows for less invasive, safer procedures, leading to an increase in positive outcomes and faster patient recovery. The hybrid operating room will incorporate the most current integrated operating room technologies. A modular ceiling diffuser system, which removes contaminants and provides HEPA-filtered air, will be hung directly above the patient table. An X-ray imaging system that moves freely in the treatment area will provide more room around the patient table and allow easy access to other equipment. An engineered modular ceiling and wall system with stainless steel clad surfaces will support flexibility and minimize downtime to adapt the room for continually changing needs. Evidence-based design and a sustainable design approach will support the health and safety of both the patients and the caregivers. PDT's healthcare studio is also working on an ICU renovation, hospital imaging rooms, a surgery center master plan, an audiology center, and a neuroscience research facility that includes exam rooms, imaging and testing rooms, research offices and lab spaces. Learn more about PDT's healthcare projects here.